Looking for the best supernatural anime movies and shows that will give you chills? You’re going to love this top 10 list! We’ve got everything from ghosts and ghouls to death gods, from hilarious afterlife hi-jinks to terrifying devourers of human souls. I asked my resident anime addict…er, expert…to pick his top ten favorites from a sea of supernatural anime. Read on to find out which ones he recommends! First though, let’s talk a bit about the supernatural themes in anime. To me, a “supernatural” show is one that focuses primarily on ghosts, demons, vampires, or werewolves. In Japan, however, that list can be expanded to include everything from gods to elves to alternate realities. In the US, while it’s a popular genre, there’s a relatively short list of shows that fit into the supernatural category, compared to, say, legal dramas or crime shows. Trust me, I know. I’ve binged-watched almost all of them several times and spent hours searching for more! See, while nearly half of all Americans believe in ghosts, according to this poll, they aren’t really a major part of our culture. Sure, we tell ghost stories around the campfire, but to most, that’s all they are…stories. In Japan, it’s a completely different story. Check out this video about mystical creatures from Japan, then read on for more info about the role of the supernatural in the Land of the Rising Sun. In the Japanese culture, the vast majority do believe in ghosts. I can’t find exact numbers, I’m sorry. I can tell you as someone who lived in Japan for two years that ghosts and the supernatural are a large part of their culture. In fact, they have six different names for different types of ghosts, from the vengeful martyred Goryo to the Zashiki-warashi, mischievous child-ghosts! While in the US, our ghosts are usually connected to a specific house, chunk of land, or person, Japanese supernatural creatures roam the entire countryside! Aka Manto– (above) a ghost that haunts public bathrooms. Thankfully, I never ran into a caped creature asking me if I want red or blue TP during my time there! Bakeneko– a monster cat that comes out to feed on small animals…and occasionally people! Karakasa-obake– (below) mythical ghosts that take the shape of an umbrella…with an eyeball! Don’t worry, he’s a relatively playful spirit. From epic festivals to simple things like sweeping “evil” out your front door with a broom, the supernatural plays a significant role in Japanese culture, so it makes sense that it would play a big part in their entertainment. That said, there are some movies and shows where it features more prominently than others. Let’s check out the top 10 supernatural anime now, shall we? This post contains affiliate links. If you make a purchase through these links, we earn a small commission at no extra charge to you. I’ll tell you where to find it streaming, plus give you the link to grab it on Amazon (some are Prime Video, others you’ll have to buy). Ryuk gets bored of his death god lifestyle and decides to do a little experiment. He wants to see how humans would use his Death Note, so he just kind of plops it into their realm for one to find. A high-school student, Light Yagami, find the note and decides to use it to rid the world of criminals. The cops think he’s a serial killer targeting bad guys (kind of like Dexter, but with a death god as his weapon) and go after him. It’s one of my son’s favorite anime on Netflix. Just make sure you’re watching the subbed anime and not the sub-par live action movie. Tokyo isn’t the city it used to be. Instead, it’s a cruel, cruel world where creatures called ghouls have all but taken over. These ghouls have a taste for human flesh and they have no mercy. The scariest part: they can look just like you and me! The story follows Ken Kaneki, a college student, and Rize Kamishiro, a girl who isn’t exactly what she seems. Long spoiler-less story short, Ken ends up learning how to live as half-ghoul and half-human. This one is streaming on Hulu, both dubbed and subbed. Blue Exorcist is perfect for those looking for a supernatural anime that features creatures that we kind of already know from our own superstitions- the devil. In Blue Exorcist, two mirrored worlds exist parallel and attached to each other. In one world (Assiah), we have people living out their lives as usual. In the other, Gehenna, we’ve got Satan and his merry band of demons, just living out their lives. The two worlds aren’t supposed to interact, but sometimes a demon gets through and possesses a person. That’s where the exorcists come into play. The show revolves around Rin and his twin Yukio, who were raised by a priest/exorcist named Father Shiro. One day, Shiro dies trying to protect them, and Rin finds out that he’s not just a normal orphan, but the son of Satan himself. Rather than using his power for evil, he decides to become an exorcist, too. Find it both dubbed and subbed on Hulu, or subbed on Netflix or Amazon Prime Video. Poor Otonashi wakes up only to find out that he’s dead. Even worse, he doesn’t remember anything except his name. Gun-toting Yuri fills him in and explains that they’re in the afterlife, and that she’s leading a war against the “evil” Tenshi, a girl who seems pretty decent to Yuri. Otonashi joins the war and battles Tenshi, but finds that he rather likes her! He spends the show trying to get back his memories, figure out his attraction for Tenshi, and learn the ways to the afterlife. My son watches this one on Crunchyroll, a subscription service for anime lovers. I can’t find it anywhere else, except to buy on Amazon. Life’s hard when you’re just a minor god without a single shrine dedicated to you. How demeaning it is to have to do odd jobs for a mere 5 yen (which is basically a nickel) each. Even more so when your weapon partner runs out on you! That’s life for Yato, a “Delivery God” who dreams of having his own slew of worshipers! Just when things seem bleakest for Yato, a young girl “saves his life” by diving in front of an oncoming car. While she survives, her soul jiggles loose enough to leave her body. She wants to be normal again, but Yato can’t do it without a new partner, so Hiyori helps him out. Will Yato’s luck turn around? Find this one on Hulu both dubbed and subbed. Remember how we talked about devourers of souls above? Well, here they are! Hollows, a main antagonist in Bleach, are spirits that like to eat souls. Ichigo was just a normal high school student before a Hollow attacked his family. He meets Rukia, a Soul Reaper who ended up severely injured while trying to save Ichigo’s family. She gives her powers to Ichigo, leaving him in charge of hunting down the Hollows. Fortunately, he’s not alone. Turns out a couple of his classmates have some pretty extraordinary powers of their own to help him out! Bleach was on Netflix, but as of today, it’s gone, along with Naruto and Inuyasha. It’s still on Hulu and Crunchyroll, though. If you want a supernatural anime that feels the most like the supernatural ghost story genre in the West, Another is the way to go. 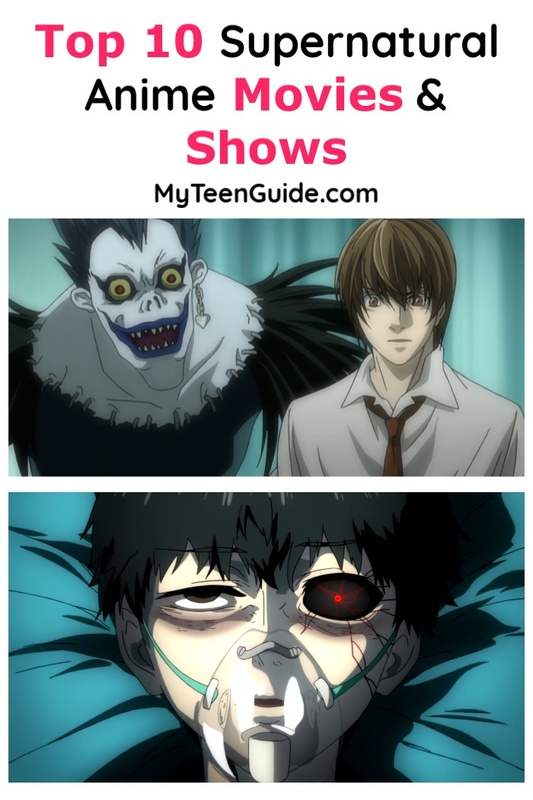 It’s a good introduction to the genre for new anime fans, since it’s full of elements that we recognize from our own horror films. 26 years ago, middle school student Misaki passed away, leaving the entire town of Yomiyama shrouded in doom and gloom. 26 years later, Kouichi transfers to the same class and finds that all of the students are a bit gloomy . He is drawn to Mei, a girl that no one seems to like…or even acknowledge. As he gets closer to her against all warnings, he learns the truth behind the doomy/gloomy atmosphere plaguing the class. Another is available subbed on Hulu. What would you do if the dead suddenly started rising all over your country? That’s what happens to Japan in High School of the Dead! When Takashi Kimuro has to kill his best friend, who was bitten, he vows to protect his friend’s girlfriend, Rei. They escape their school only to land in a world that’s already fallen to the undead. Takashi, Rei, and other students join together to find their families and discover the secret behind the rising dead. Think Walking Dead meets 28 Days Later , except with high school students and in anime form. Find it subbed and dubbed on Hulu. If vampires are your supernatural creature of choice, you’ll love Bakemonogatari. Although Koyomi managed to survive a vampire attack and stay human, it turns out that almost become undead has its side effects, including super vision and speedy healing. Still, he’s determined to live a normal life with the help of his friend Tsubasa. When Koyomi saves a girl who fell down the steps, he realizes she has some powers of her own. Koyomi goes back to the strange man who saved him from vampires and learns about the supernatural world. He spends his life helping others who are just learning to deal with their own supernatural powers. Find it subbed on Hulu and Amazon Prime Video. When a fire kills his whole family, Shirou goes to live with Kiritsugu, who teaches him magic. Years later, Shirou lands in the middle of a fight between two Servants, who happen to be superhumans. While Shirou manages to survive a near-fatal injury, the Servants need to finish the job, so they come after him. Shirou summons his own Servant and the two fight together in the Fifth Holy Grail War. The prize, of course, is the Holy Grail, a mythical relic that just about every society searches for at some point! Now that we’ve checked out our top ten picks for the best supernatural anime, let’s talk a little about the best places to find these and more anime shows. So, I want to talk about this for a moment because there are hundreds- if not thousands- of anime movies and shows, and some streaming services have a more robust catalog than others. Right now, we have four streaming service subscriptions that my son uses for his anime binge-fests. While Netflix is probably the most popular streaming service in general, up until recently I wouldn’t have called their anime category robust. According to Ranker, in 2017 they had about 40 good titles. Throughout 2018, that number has gone up quite a bit, but as I mentioned above, they are losing some of their most popular anime shows, including Naruto. However, Netflix is one to watch in the coming months and years, as they’re dedicating a good portion of their massive budget to anime throughout 2018, according to Inverse. Inverse has a list of all the anime coming to Netflix this year, so check it out. Before Crunchyroll (which we will get to in a minute), Hulu was THE place for my son to find anime. He loves that so many of the shows are both dubbed and subbed. I’m not sure of the exact number of anime on Hulu, but ReelGood has a list that keeps on going. Seriously, I hit “load more” like 7 times! Hulu makes finding great anime as easy as one click by giving the genre its own heading on the website and the app. They also divide it up into subgenres, including supernatural anime. I highly suggest paying the extra couple bucks a month to upgrade to commercial-free Hulu. While the entry plan costs $7.99/month, commercial free is only $11.99/month. It’s worth paying the extra $4 (and still cheaper than Netflix!). Click here to get to the anime section on Prime Video (if you go to it through the app, it doesn’t seem to list even half of the shows). You’ll notice that there are about 190 videos included with Prime, and an additional 85+ to rent or buy. Amazon has a good mix of genres, as well as older anime mixed with newer titles. One thing I like about Amazon versus other streaming services is that you can see reviews and customer ratings right away. Netflix ditched reviews/ratings, and Hulu shows you the average number of stars, but that’s about it. Crunchyroll is new to me, but very popular with anime fans. My son pays $7 for a monthly subscription. Well, actually, I pay for it, but that’s besides the point. Along with hundreds of “watch anytime” anime, Crunchyroll also offers a few dozen shows simulcast so you can watch new episodes as they air. Fans can also read a ton of manga titles as part of their membership. More than just a streaming service, Crunchyroll also has a ton of forums so you can talk to other anime fans about your favorite shows. Funimation– For $5.99 a month you can watch all of Funimation’s licensed shows without ads, including Attack on Titan and My Hero Academia. They do offer a free trial to test it out. YouTube– YouTube is hit or miss with anime, but there are a few channels that run full episodes legally. Viz– Viz is one of the largest publishers of both anime and manga, and you can use the site to watch many of their licensed shows for free. HIDIVE– I’ve never heard of this one until today, but they claim to be the ” leader in legal HD anime streaming.” They do have some free episodes, but for most content you’ll need a subscription, which runs $4.99 a month after a 7-day free trial.